The GRAB BAG offers a target representing a player’s upper body. Inside the torso is a spring mechanism that permits the “upper body” to rotate left or right. Shoulder pads and jersey can be strapped on for added realism. Use the Grab Bag to teach a player how to use his hands and where to find the contact and control points. Against this sled, work on the rip, swim, club, counter, slap, spin and bull rush moves. Narrow base allows a Pass Rusher to shoot straight up field. 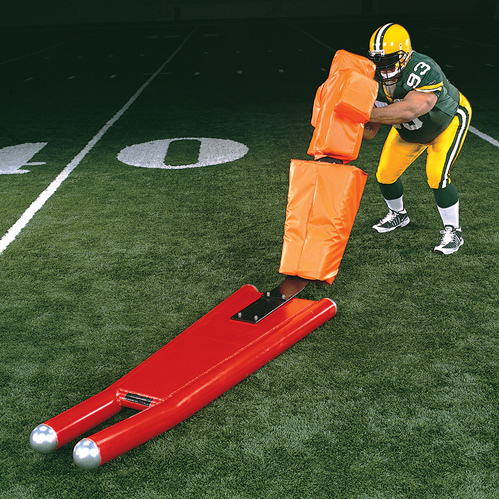 "The coaching point is to learn how to apply pressure and use leverage to turn a blocker's shoulders!"